HEAD START VITAMINS FOR YOUR HAIR COMBOPAK 3-PHASE AM/PM - R Unique Beauty Supply, Inc.
Strong, healthy hair begins in the tiny follicles beneath your scalp where the nutritional needs are immense. To properly condition your hair you must get to the root of the matter, your hair follicles. 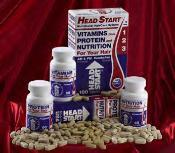 Head Start ? utilizes niacin, a natural peripheral vasodilator which, like minoxidil, serves to deliver more nutrients to your hair, allowing it to grow and develop as strong and healthy as your own body's metabolism will allow. Please allow additional time for shipping.